There are lots of ways the NHL rewards failure and punishes excellence, like the player draft, ever shrinking salary caps, and the half-win award for participating in overtime, but even the way in which playoff pairings are decided has a perverse incentive. - 3. Home team advantage for playoff games more often. 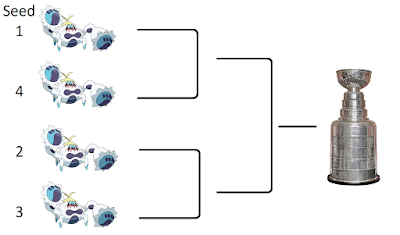 Here I argue that the first-round pairings are not as favorable as they could be. I’ve talked about the consequences of this in general sport in the previous article “Draft Pairing Tournament Format”, but in this post I talk numbers and the case of the 2019 President’s Trophy winners, the Tampa Bay Lightning. In a best-of-7 series, being paired with a team you can beat more than 50% of the time matters a LOT. 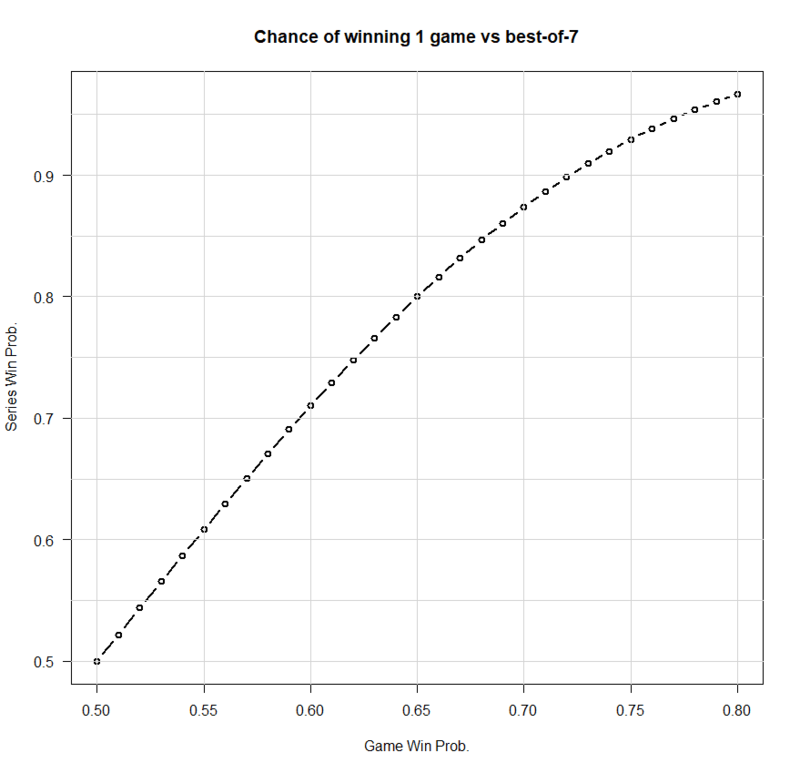 Every 1% of chance of beating an opponent in a single game translates into roughly 2% of chance in a series. 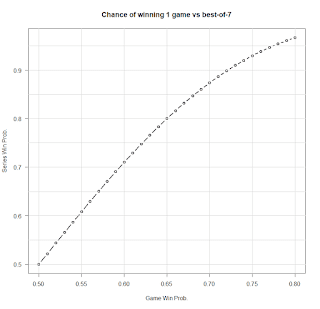 Figure 1: Every 1% of win chance in a game translates to roughly 2% in a best-of-7. 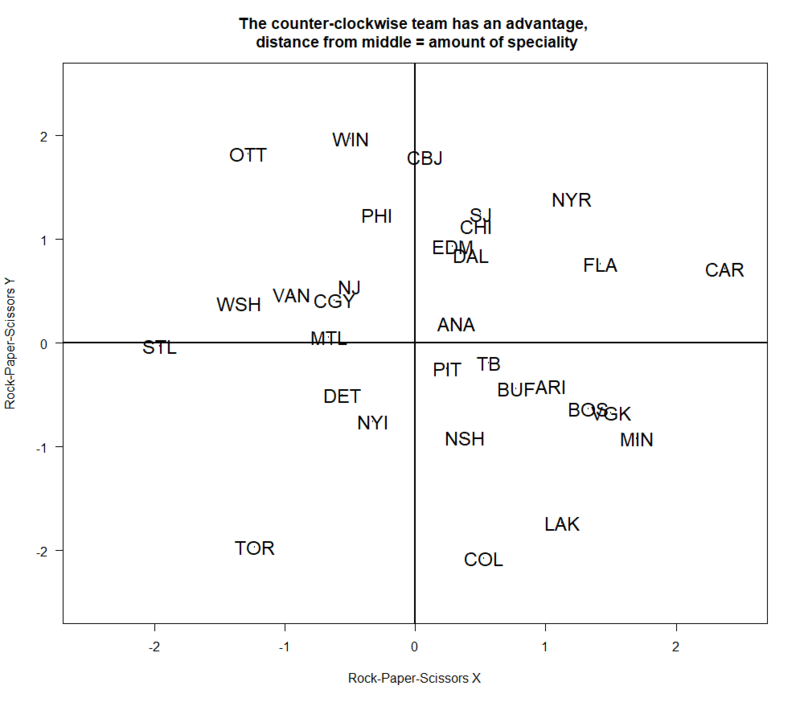 Figure 2: Four teams of different strength, but otherwise identical. Figure 3: Four teams of different strength, as well as specific weak and strong areas. 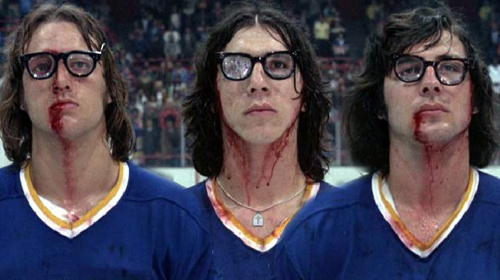 For those that didn’t grow up with these three Pokémon, first, what was it like to see a Canadian team win the cup? Second, imagine hands holding “rock”, “paper”, and “scissors” instead of adorable little mutants. Here, fire beats plant (Bulbasaur, onion on back), plant beats water (Squirtle, turtle), and water beats fire. In that top bracket, that Squirtle is hosed. He played the best the regular season, and what does he get for it? THE LEAST FAVORABLE MATCHUP. To maximize his chances at the second round, he would rather play either of the other two opponents, but instead the system meant to help him has done the opposite. Bulbasaur gets a free pass again. 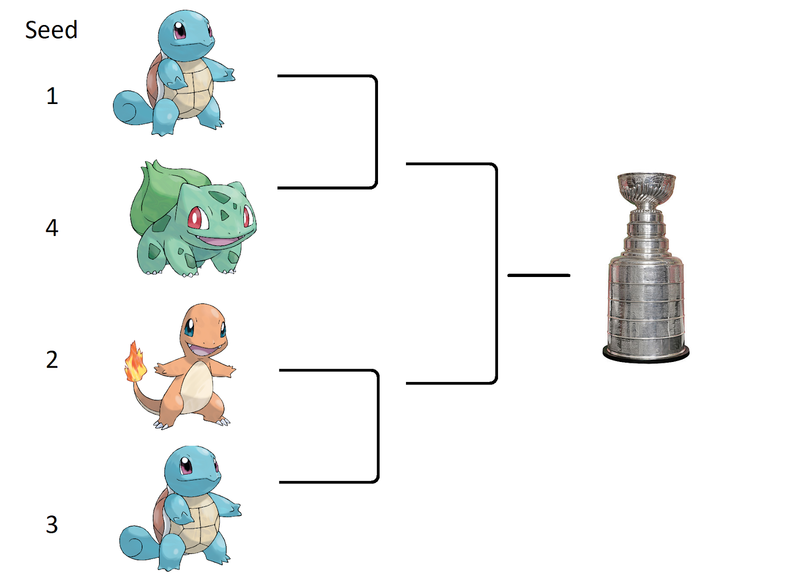 Being in the top seed, that Squirtle probably made it into the playoffs with a few wins to spare. Tactically, it would have been better to lose a few of those on purpose near the end, if that particular matchup was looking likely. So how do we fix this? We let the Squirtle pick their opponent. The remaining two can fight each other. - ALWAYS an incentive to aim for a higher seed, to either get a better pick, or avoid being picked by your counter. - More entertainment when a team picks to play an unusually high seed. If a team avoids picking the lowest ranked available seed, we can ask “what do they know and fear?”. - Adds more analytical depth. - It gives the first team too much power. 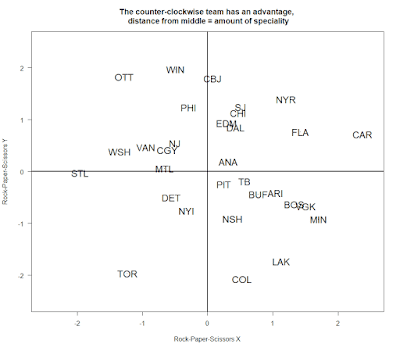 - Teams that try to avoid being picked early by being as costly to beat as possible. See Figure 4. Figure 4: Long before 'Mmmbop', the Hansons were MEN. Look upon your Lightning, they mighty, and despair. They won over 70% their regular season games, and played against a 50/50 team. They had home team advantage. Don't worry though, lightning will always be dangerous on the golf course. Effects are additions to an exponent, so a baseline of 0.854 means a baseline team (Anaheim) scores exp(0.854) = 2.349 goals per hour. A team at home scores exp(0.102) = 1.107 times as much as a visiting team. Tampa Bay scores exp(0.478) = 1.613 times as much as the baseline team. Which translates to a series win chance of 82% before we consider the rock-paper-scissors aspect. For the rock-paper-scissors (RPS) part, we’re going to use a simplified version of the analysis in “Modeling Intransitivity in Matchup and Comparison Data” by Shuo Chen and Thorsten Joachims to give each team a position on a clock. If a team is clockwise of an opponent, we will model them as having an advantage, with the greatest advantage happening at 90 degrees and for teams that are both far from the centre. In mathematical terms, we are taking the magnitude of the cross product of the teams’ locations. We get these positions, shown below in Figure 5. The farther from the middle a team is, the more specialized it is. For example, Anaheim, Pittsburgh, and Tampa Bay are all-rounders that have no particular strength or weakness against particular teams. On the other hand, Boston has an advantage over Toronto, which has an advantage over St. Louis, which has an advantage over Columbus, which in turn has an advantage over Boston. Using the offense and defensive strengths, as well as the rock-paper-scissors parameters, we can get new estimates of Tampa Bay’s home game, away game, and series chances against their 7 candidate opponents. Since the Lightning seems to dominate everyone about equally, these estimates are not going to be massively far off from what they would be without incorporating rock-paper-scissors, but they will have an effect. To get a sense of the effect, notice that the series win chance against CBJ has dropped from 82% to 78%, and that the RPS advantage is small and negative. Boston may be a stronger overall team, but TB seems to be able to get around that, this the RPS advantage against Boston is larger and positive. There are two teams which the President’s Trophy winners would have a distinctly larger advantage over than the opponents they were ‘rewarded’ with. That 8% of a series win they would have been given for choosing to play against Carolina isn’t nothing; 8% of a second round is like 1% of a Stanley Cup, thrown down the toilet. This gives too much power to the first team. What if the 2nd seed has a late-season injury or suspension of their star player? Then the 1st seed might elect to play them before the player returns, to avoid facing them later at full strength. Such a match up would reward the 1st seed, but that 2nd seed also did well in the regular season, they don’t deserve this. To fix this, professor Tim Swartz suggests a more restricted draft: Seeds 1-4 choose from seeds 5-8, in order of rank. This has the added advantage that every team knows before the draft whether they will be picking an opponent or be picked. It’s also a smaller change for those skeptical of the pairing draft, while preventing perverse incentives. Teams in seeds 1-4 always want to be a higher rank to choose first, and teams in seeds 5-8 cannot benefit from losing the last game or two of the season to try for a favorable higher seed pairing. Technically, seed 4 isn’t choosing because they’re left with the one remaining opponent among seeds 5-8, but they still benefit by not being in the pool of draftees to begin with. Follow-up: How big is that home team advantage? Surely THAT reward is worth something. Not really, not when it’s 4 games out of 7. Let’s radically simplify this down to a + or - % of winning. For example, if a team has a 50% chance of winning on neutral ice and the home team advantage is a +/- 6%, then they will win 56% of home games and 44% of away games. Across all teams and all games in the NHL, the home team wins 56-57% of the time, but in case there are other effects in the playoffs, let’s consider a variety of levels of advantage from 0 to 10%. No reasonable amount of home team advantage is going to give the top seed the upper hand if they are also the weaker team somehow. The real reward for being the top seed in the regular season is the pairing.